A satisfying blend with the great taste of sungyod rice. Smooth, tasty and unique. Aromatic from dark roasted sungyod rice and benefit from rice. A great alternative for the health conscious. Aromatic from dark roasted rice. 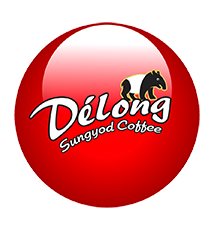 Delong riceberry combination of premium coffee, riceberry, sungyod rice and white kidney bean. Not mix sugar, Low fat and benefit from rice. "Delong Ricemalt 3in1" is a flavourful combination of cocoa, sungyod rice, riceberry and malt. Aromatic from dark roasted rice with a smooth cocoa mouth feel. Benefit from sungyod rice, riceberry and malt. A perfect smooth blend of the robusta coffee. Rich, quality creamy and aromatic, it has dark coffee flavor and no sour. Is a coffee with a mixture of herbs without sugar, suitable for all ages. Employee of delongcoffee to the remembrance of His Majesty King Bhumibol Adulyadej's. Delong "Sangyod rice, Phatthalung rice that is rich in Delong benefits" Sangyod rice, Phatthalung rice, rich in many benefits "
Sangyod Rice, Phatthalung Rice "Southern rice growing area" Is the famous rice of Phatthalung province and is full of many benefits.